Summer has set in for reals here in the Midwest. I’m talking about waking up to 85 degrees with 81% humidity and thunderstorms that roll through with the energy of an angry two-year old. And while we might vehemently complain about the mosquitos, on the bright side, the garden is flourishing and the fireflies are magical. But more often than not, this time of year we’re in the mood for meals that are light, fun, and easy to throw together. We’re also big fans of dinner in a bowl, and this salmon chirashi bowl is all that and more. This isn’t technically a real chirashi bowl, which traditionally includes sushi rice topped with sashimi and a scattering of other raw ingredients. This recipe started from one published in the Sunset Magazine not long ago. My son had tried it and was disappointed in it and thought I might play with the flavors a bit. 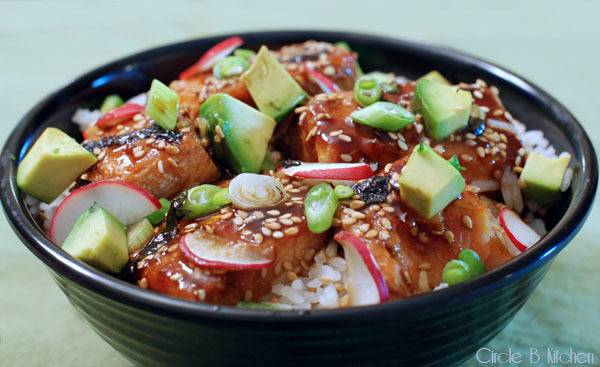 So after a little research, I put together a fairly traditional marinade for the salmon, and after messing with it a few times, landed on this version which not only gave tons of flavor to the dish, but provided a much-needed sauce for the rice. We loved it, and taster-son concurred. This is good stuff. For a fun and tasty shortcut, try tossing some large shrimp with a little olive oil, salt and pepper and roasting at 375 for about 5 minutes. 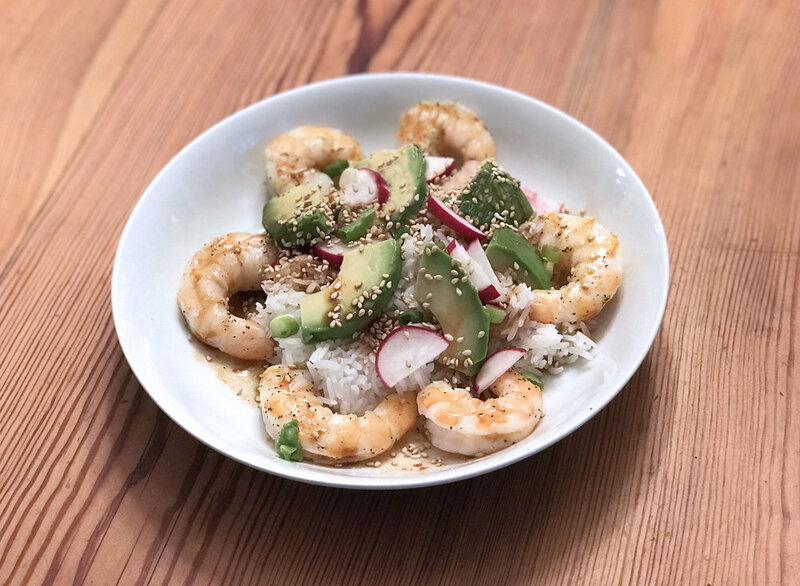 I like to place a mound of jasmine rice in the bowl, surrounded by the roasted shrimp, drizzled with our quick Asian sauce and topped with slices of avocado, radishes, scallions and a sprinkling of toasted sesame seeds. Drizzle on a bit more of the sauce before serving. You won't be sorry. Two years down the line and this is still one of our favorite go-to mid-week meals, summer or winter or whenever. If you're pressed for time, here's our recipe for a quick all-purpose Asian sauce that you can keep in the fridge for such occasions. It's killer and easier than easy. Enjoy! Mix together the marinade ingredients. Place the marinade in a Ziploc bag with the salmon, seal tightly and refrigerate for a couple of hours. Cook the rice, and while that is cooking, remove the salmon from the marinade and place on a foil-covered baking sheet that’s been sprayed with nonstick cooking spray. Save the marinade. Roast the salmon for 8 minutes. Pour the remaining marinade into a small saucepan and bring to a boil and then remove the heat and reserve. To serve, place some rice in each bowl and top with a couple pieces of the salmon. 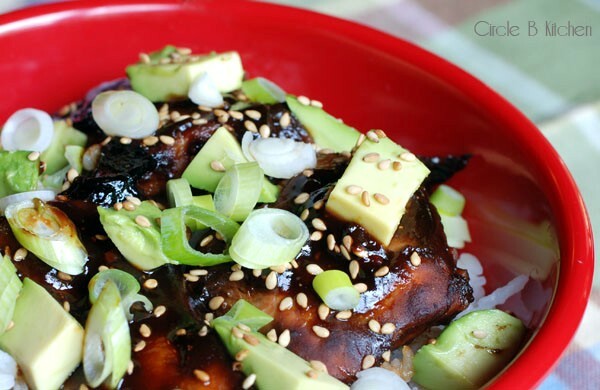 Drizzle with some of the reserved marinade and scatter the cucumber, avocado, nori, green onions and sesame seeds over the top. Since I published this recipe in 2011, I found a shortcut to the marinade that works great for a quick week-night throw-together. I just combine the Soy Vay brand of Garlic Hoisin sauce with soy sauce at a ratio of about 3 to 1 and it makes a great marinade for the salmon. If you would like to add some kick to it, you can add sriracha or chili paste.